In 1931, Lodge of the Ancient Landmarks No. 654 A.F.& A.M. GRC received its name from Lodge of the Ancient Landmarks No.441, Grand Lodge of New York. Unfortunately that lodge closed in July 2008, but was merged with Queen City-Christopher G. Fox Lodge No.358 on May 6, 2009 to become Ancient Landmarks Lodge No.358, Grand Lodge of New York. Many of the Ornaments, Furniture and Jewels in use at the present time were presented to the Lodge at its inception in 1931 and by others at subsequent dates. The original Bible for use on the Altar was presented in that year by J. Alex Robinson. The three silver gavels were given to the Lodge by Ancient Landmarks No. 441. Buffalo, N.Y. The handles of these gavels were carved from a piece of mahongy actually removed from their furniture for that particular purpose. The Wands were given to the Lodge by J. Howard Percy and the Charts by J.P.l MacKay. The engraved columns at the Warden's Chairs were the gift of Ernest Ackerman, the Tray of Benevolence from Grant McEwen and the original baton for the Director of Ceremonies from Wilfred Houser. Subsequently, in 1961, Chester Boehmer presented the Working Tools to the Lodge and his skill as a craftsman and engraver are reflected in the work which adorns them. All the Furniture, Ornaments and Jewels, although stained by smoke and scorched by flame survived the fire which destroyed the Temple in 1967 and have been replated and refurbished. The Past Master's Jewel was chosen with very careful thought from a large selection of designs submitted to our Founding Fathers. The Jewel is a symbol of the Craft and the original was embellished by three small diamond flakes. In like manner, the original Regalia was designed as a distinguishing characteristic of the new Lodge. The Aprons were slightly smaller than the Aprons in general use and the Collars narrower and shorter. The original Aprons and Collars were worn for many years, but did not survive the fatal fire previously mentioned. The Collars and Aprons were then replaced by those of today and both Aprons and Collars conform to standard size,shape and colour. The Jewels pendent to the Collars are the originals and although badly discoloured by smoke and flame were restored to their present splendour. In 1879, M. W. Bro. Weller, G.M. of the Grand Lodge of Canada announced that the Grand Lodge of Ontario which had been incorporated on February 10th, 1876 had ceased to exist and that all formalities for its extinction had been complied with. One of the member lodges within the Grand Lodge of Ontario was Mount Sinai Lodge No. 20. The brethren of that lodge now had lost all rights and privileges accorded to freemasons. Informal discussions took place between the members of Mount Sinai Lodge and others representing regular Masonic Lodges within Hamilton. Eventually sixteen brethren from these various regular lodges signed a petition for the formation of a new lodge. The proposed name at that time was to be Unity Lodge. A letter was sent to M. W. Bro. James A. Henderson Esq. Q.C. requesting dispensation to form this new lodge. Doric Lodge held its first meeting on December 11, 1879 under dispensation. A warrant was granted at the Annual Communication of the Grand Lodge of Canada on July 13, 1880. 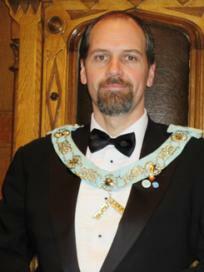 The first Worshipful Master was Ralph L. Gunn. His Senior Warden was Burwell Schram and the Junior Warden was George Midgley. The first newly initiated member was Mr. Benjamin Lewis who received his E.A. degree on June 21, 1880.